The Larson Electronics SPLT-1.06K-LM20-8XWP50-2XPTZ.23X-2TB-AT-BC-W4G solar-powered LED light tower provides a safe and effective way for operators to quickly deploy 400 watts of intense LED illumination and dual security cameras with day/night functionality to elevations up to twenty feet. This solar light plant features a telescoping light tower that folds over for easy transportation, a rotating boom that allows for 360° rotation and a removable mast head for storing the eight LED light fixtures and two IP security cameras when not in use. The unit features four 265 watt solar panels and a 1,000 aH capacity battery bank. The entire assembly is mounted onto a 7.5` single axle trailer, allowing operators to transport this solar light tower from location to location. Solar Powered Light Tower: This solar light tower includes four solar panels, solar charging system, battery bank, battery charger, LED outdoor lamps, dual security cameras w/ NVR and 24" monitor, 4G wireless router w/ an external antenna and manual crank up mast mounted on trailer with outriggers. The 1.06 kW solar generator system replenishes amp hours of usable battery capacity per day, assuming 5.5 hours of peak charging sunlight. This system delivers 24 volts for lighting mounted atop the 20` telescoping light mast. The SPLT-1.06K-LM20-8XWP50-2XPTZ.23X-2TB-AT-BC-W4G is supported by four 250aH 12V batteries, equating to 1,000aH battery capacity (500aH usable). A battery charger provides flexibility during deployment, which allows operators to supply power to the batteries using an external power source. This feature is useful for fast turnaround projects, sustaining extended periods of illumination and remote sites that lack adequate exposure to sunlight. 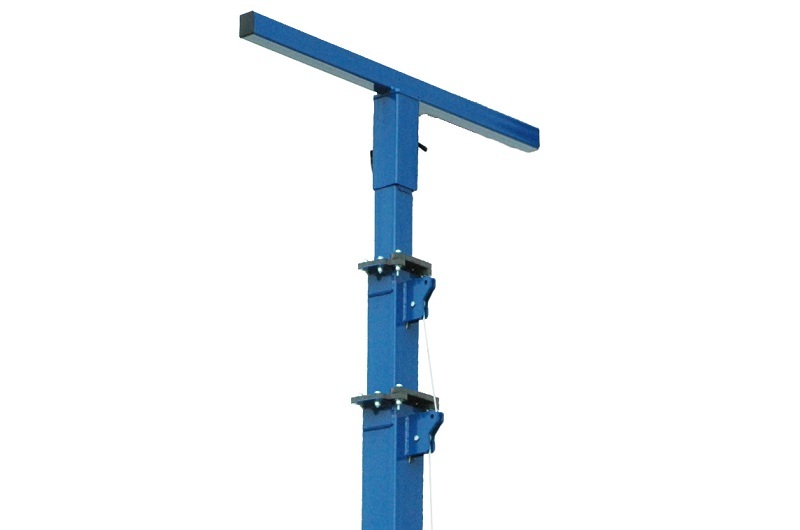 Light Mast: This telescoping three stage steel light mast from Larson Electronics is designed to allow operators to quickly and safely deploy the eight LED light heads and two security cameras in locations where this equipment must be elevated to heights up to 20` for effective coverage. This light boom can be extended to 20` above the trailer floor for maximum area coverage, and collapsed to 12` for applications where a smaller footprint is required. The tower is constructed of square steel tubing with a lower section 12 feet in length and 4 inches in diameter, a middle section 8 feet in length and 3.5 inches in diameter, and an upper section 6 feet and 3 inches in diameter. Each section has 2` of overlap. The mast is elevated using an included 1,000 lbs. 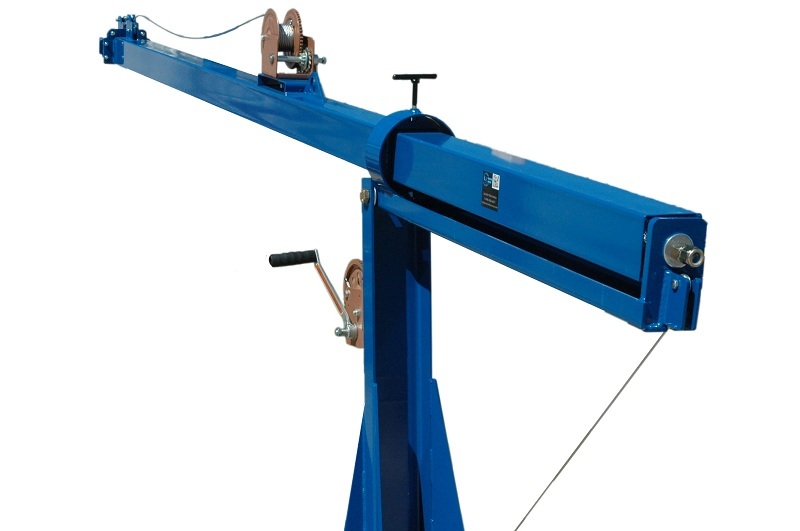 hand winch with 3/16 inch cable and extended to its full height using a second 1,000 lbs. winch. The LM family of telescoping towers feature a proprietary mast guidance system, which provide increased stability during high winds. Four 1,000 lbs hand crank leveling jacks are used for leveling. The jacks can be leveled by hand crank or attachment provided for power drills. These outriggers can be extended 2` out from the side of the trailer for added stability. When lowered to 12`, the mast can withstand winds up to 125 mph. Custom builds can be provided for higher wind speed resistance when fully raised. LED Light Fixtures: This solar light plant is equipped with eight 50-watt LED lights. The light assemblies each consist of four 12.5 watt LEDs paired with high purity specular optics to produce a light output distance comparable to that of a 400 watt metal halide. The LED wall packs are designed to withstand demanding conditions and are waterproof, vapor proof and built to resist the damaging effects of an outdoor environment. The lights are housed in a waterproof aluminum housing that is powder coated for added durability and resistance to corrosion. The housing incorporates integral cooling fins for efficient heat dissipation and increased LED longevity. The LED lamp assemblies are protected by a shatterproof polycarbonate lens, which is secured to the housing with a waterproof seal. A 1/2" waterproof connector provides a secure and sealed power connection point and rounds out this units` weather resistant construction. Lamp Control: Each lamp can be powered on individually, allowing operators to power one lamp or all eight lamps at a single time to fit the required illumination requirements. An equipped dusk-to-dawn day/night sensor allows for automated operation of the light configuration set within the control center. Operators may also set a time/duration for light activation using the built-in auto timer feature. IP Security Cameras: This solar-powered system is equipped with two, cutting-edge security cameras. The units provide crisp 1080p full-HD high resolution images. A 4.7-94mm varifocal lens automatically adjusts focus, providing operators with precise 20x optical zoom levels. Integrated long-range IR LEDs, with a wavelength measurement of 850 nm, enable the day/night cameras to see distances up to 492` under nighttime conditions. The cameras offload videos in MP4 format and features H.264 and MJPEG video compression. The IP security cameras are designed to perform in outdoor locations and rainy conditions. These IP66-rated units resist the negative effects of non-corrosive liquids. De-fogging features enable the cameras to operate in rainy and foggy conditions. The devices are capable of operating in temperatures between -22°F and 149°F. The cameras are secured to the top of the mast for elevated positioning. The mounting brackets allow 360° rotation for precision aiming. The security cameras are designed to operate on 24V AC or PoE (IEEE802.3at). Link-up with the devices is achieved via a customer-provided cable. The cable video/power drop cable can be routed either through the mounting surface or through a cable guide on the edge of the mounting base. Our explosion proof cameras with Power over Ethernet (PoE) features enable data transfers and power to be passed through a single Ethernet cable that is usually a Cat 3/Cat 5 cable or better. There are several types of PoE, which come with their own respective standard and maximum power to port capabilities. The IEEE 802.3af PoE standard, with a voltage range of 44.0 - 57.0V, offers 15.4W of DC power for each port. The IEEE 802.3at PoE standard, with a voltage range of 50.0 – 57.0V, provides up to 30W of DC power per port, which is ideal for surveillance cameras, antennas and network access points. The IEEE 802.3bt PoE standard, with a voltage range of 50.0 – 57.0V, provides 60W of DC power for each port. In order to utilize PoE properly, the components, such as the receiving unit and sending device, must be PoE compliant. NVR: The solar tower contains an 8-channel NVR that can be used with the network cameras. Setup only takes minutes via plug-and-play, which automatically detects, displays and configures system components. With multiple recording modes (Schedule, Continuous, Motion Detection and Event) and 2TB of storage, users could capture hours of footage with ease. The remote configurable network recorder features a bit rate of 40Mbps incoming and 80Mbps outgoing at up to 60fps per channel. To maximize storage, the unit supports H.265, H.264, and H.264 OVC video compression. The network recorder is compatible with two-way audio streaming (camera dependent) and includes 9 Ethernet ports (RJ-45 interface). During recording, the unit handles the following data: activity log, email notification, event log, event notification, video analytics and event search. This device offloads videos in MP4 format. Cameras hooked up to the NVR may use power directly via PoE (802.3af / 802.3at) during operation. The NVR runs on 100 - 240V AC of power and is suitable for use in temperatures between 14°F - 131°F. When using the NVR, operators may access a 1080p monitor that is virtually borderless, for side-by-side screen setups that flow together almost seamlessly. The monitor can be tilted forward and backward allowing operators to adjust to their preferred viewing angle. This LED monitor has power saving features to minimize energy consumption and has wall mount capabilities. This video recorder accepts USB mouse and keyboard inputs. The unit is fully capable of being controlled via mouse input only and offers an on screen keyboard for password inputs, eliminating the need for a keyboard if not desired. USB mouse ships standard with the video recorder. USB keyboard sold separately. Router/Wireless 4G Hotspot: Connectivity features are facilitated by a 4G/LTE rugged router. Equipped with built-in security, the unit offers 600 Mbps internet speeds (minimum). The internal router can be utilized to monitor uptime and for real-time alerts. Customers must provide their own 4G service/plan for the router, as the system does not come with an internet plan. An external antenna is available for signal boosting and extending hotspot coverage. The antenna measures 12` and offers compatibility with the following frequencies: 690~960 MHz, 1710~2170 MHz and 2500~2700 MHz. Solar Panel Assembly: This unit is comprised of four 265-watt solar panels, generating a total maximum output of 1.06 kW. The panels are mounted securely on a sliding assembly. During deployment, the top solar panels slide out to form a four-panel array for maximum exposure to sunlight. The panels are wired to the solar charger control box which manages the charging system. When in use, the four solar panels are angled at 45° to capture the intensity of the sun for optimized light intake. Applications: Remote work locations, construction sites, military bases, camping sites, outdoor events, security applications, emergency services, outdoor lighting, portable lighting and more.